Arbitrage: There are a number of sub-strategies that fall under arbitrage. 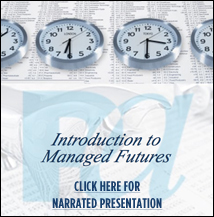 The most prevalent in the managed futures industry is statistical arbitrage. A simple example of this is simultaneously buying gold on one exchange (for a lower price) and selling gold on another exchange (for a higher price). This strategy looks to profit from the price difference. Average Commission: Represents the average commission rate of the composite track record. A higher or lower commission rate would increase or decrease the performance accordingly. Average Rate of Return (ROR): This is a simple average return which is calculated by summing the returns for each period and dividing the total by the number of periods. The simple average does not take the compounding effect of investment returns into account. Average Monthly Return: This is a simple average of the monthly reeturns. It is calculated by summing the returns and then dividing the total by the number of gain periods. Calmar Ratio: This is a return/risk ratio. Return (numerator) is defined as the Compound Annualized Rate of Return over the last 3 years. Risk (denominator) is defined as the Maximum Drawdown over the last 3 years. Compound Annual Return (CAROR): This is the rate of return which, if compounded over the years covered by the performance history, would yield the cumulative gain or loss actually achieved by the trading program during that period. Correlation: Correlation is a measure of the interdependence between two investments. Correlation conveys to us the degree to which the variations of returns from their respective means move together. Hence, if two investments are positively correlated, when one performs well the other should perform well. If two investments are negatively correlated, when one performs well the other should perform the opposite or poorly. Correlation coefficients are measured and assigned scores of between + 1.0 and -1.0. A +1.0 is a perfect positive correlation. A -1.0 is a perfect negative correlation. Counter Trend or Mean Reversion: This strategy seeks to profit from trend reversals. If you look at any chart, nothing will move straight up or down. There are often pullbacks and reversals. This strategy looks to profit from those type of moves. Crisis alpha opportunities: profits which are gained by exploiting the persistent trends that occur across markets during times of crisis. Discretionary Trading: Method of trading that relies on subjective (human) entry/exit criteria. Downside Deviation: considers only returns that fall below a defined Minimum Acceptable Return (MAR). The MAR is currently set at 5% and the downside deviation measures the variation of each period that falls below 5.0%. Drawdown: Defined as the greatest cumulative percentage decline in net asset value due to losses sustained by the trading program during the year in which the initial net asset value is not equaled or exceeded by a subsequent asset value. Drawdown & Recovery Report: The Drawdown Report presents data on the percentage drawdowns during the trading program's performance history ranked in order of magnitude of loss. Emerging CTA: An emerging CTA is one whose track record is less than five years and has less than $100 million dollars in assets under management. Futures Commission Merchant (FCM): Individuals, associations, partnerships, corporations, and trusts that solicit or accept orders for the purchase or sale of any commodity for future delivery on or subject to the rules of any exchange and that accept payment from or extend credit to those whose orders are accepted. Fundamental Analysis: Method to forecast futures prices by attempting to measure the intrinsic value of a particular future. Fundamental analysts study the economy, supply and demand factors, weather and other conditions. Forex: Refers to the over-the-counter market for foreign exchange transactions. Also called the foreign exchange market. Gain Deviation: Similar to standard deviation, except this statistic calculates an average (mean) return for only the periods with a gain and then measures the variation of only the gain periods around this gain mean. This statistic measures the volatility of upside performance. Global Macro/Fundamental: Commodity trading advisors that trade the markets from a fundamental approach will often look at crop reports, weather patterns, economic reports and other fundamental data to determine whether to trade. Hedger: A trader who enters into positions in a futures market opposite to positions held in the cash market to minimize the risk of financial loss from an adverse price change; or who purchases or sells futures as a temporary substitute for a cash transaction that will occur later. One can hedge either a long cash market position (e.g., one owns the cash commodity) or a short cash market position (e.g., one plans on buying the cash commodity in the future). High Water Mark: A requirement that the fund must recoup any prior losses before the investment manager may take a performance (incentive) fee. In addition to performance losses, prior losses may include any combination of fees that the investment manager charges, such as management and administrative fees. Incentive ("Performance") Fee: A type of fee that gives a portion of the returns of a fund or investment to the manager as a reward for positive performance. The fee is generally a percentage of the profits made on the investments. This type of fee is designed to reward managers for increasing the value of a portfolio, since investors will see value only when the portfolio grows. Kurtosis: Kurtosis characterizes the relative peakedness or flatness of a distribution compared with the normal distribution. Positive kurtosis indicates a relatively peaked distribution. Negative kurtosis indicates a relatively flat distribution. Lock-up Period: A time period during which a new investor in a fund may not withdraw any capital committed to the fund. Loss Deviation: Similar to standard deviation, except this statistic calculates an average (mean) return for only the periods with a loss and then measures the variation of only the losing periods around this loss mean. This statistic measures the volatility of downside performance. Management Fee: A charge levied by a trading advisor for managing an account. The management fee is intended to compensate the managers for their time and expertise. Margin-to-Equity: Represents the amount of trading capital that is being held as margin at any particular time. The low margin requirements of futures results in substantial leverage of the investment. However, the exchanges require a minimum amount that varies depending on the contract and the trader. The broker may set the requirement higher, but may not set it lower. A trader, of course, can set it above that, if he does not want to be subject to margin calls. Mean Reversion: Mean reversion refers to the theory that prices and returns tend to move back to the average or mean. The average can be a historical average for the industry or growth in the economy. Option: A security that represents the right to buy or sell a specified amount of an underlying investment instrument such as a stock, bond, futures contract-at a specified price within a specified time. The purchaser acquires a right, and the seller assumes an obligation. Option Writing/Sellers: Option selling is a strategy that focuses on writing options (and collecting their premiums) that are likely to expire worthless. The idea is that the commodity trading advisor will benefit from the premium he or she collects from the buyer. The risk associated with this strategy, however, is that the options will not expire and the contract will go in the money. Within this strategy are naked option writers and spread option writers. PAAM Discretionary CTA Index: is an equal weighted index comprised of CTAs whose trading strategy is at least 70% discretionary. These CTAs do not represent the complete universe of CTAs. CTA programs with proprietary performance are not included. Monthly numbers are updated until 45 days after the end of the month. PAAM Option Writer Index: is an equal weighted index comprised of CTAs whose trading strategy is at least 70% option writing. These CTAs do not represent the complete universe of CTAs. CTA programs with proprietary performance are not included. Monthly numbers are updated until 45 days after the end of the month. PAAM Stock Index Trader Index: is an equal weighted index comprised of CTAs that allocate at least 70% of their portfolio to stock index trading. These CTAs do not represent the complete universe of CTAs. CTA programs with proprietary performance are not included. Monthly numbers are updated until 45 days after the end of the month. Pattern Recognition: Method used to find a repetitive series of price movements on a chart. These patterns are used by a technical analyst to predict future movements of the market. Proprietary Performance: Performance where more than 50% of the beneficial interest is owned by the firm, its affiliate, family member or any person providing services to the account. Proprietary Performance must be disclosed separately from customer performance. Redemptions: The time period in which an investor in a fund may withdraw his or her capital from the fund. For example, quarterly redemption allows an investor to withdraw capital every quarter. Round-Turns per Million: Measures the frequency with which a trading advisor initiates and subsequently closes out a market position on an average million-dollar account over a one year period. Sector Rankings: Inclusion of a CTA in any particular sector is based on field selected by the CTA which best exemplifies their program. Since the categorization of market focus and trading styles is subject to change and is of necessity subjective in nature, IASG does not take any responsibility for including or failing to include a CTA in a particular sector. Sharpe Ratio: A return/risk measure developed by William Sharpe. Return (numerator) is defined as the incremental average return of an investment over the risk free rate. Risk (denominator) is defined as the standard deviation of the investment returns. Park Avenue defines the value for the risk free rate as 1%. Skewness: Describe asymmetry from the normal distribution in a set of statistical data. Skewness can come in the form of "negative skewness" or "positive skewness", depending on whether data points are skewed to the left (negative skew) or to the right (positive skew) of the data average. Soft: (1) A description of a price that is gradually weakening; or (2) this term also refers to certain “soft” commodities such as sugar, cocoa, and coffee. Sortino Ratio: This is a return/risk ratio developed by Frank Sortino. Return (numerator) is defined as the incremental compound average period return over a Minimum Acceptable Return (MAR). Risk (denominator) is defined as the Downside Deviation below a Minimum Acceptable Return (MAR). Park Avenue currently uses 5% as the MAR. Spread: (1) In a quotation, the difference between the bid and the ask prices of a futures contract. (2) An options position established by purchasing one option and selling another option of the same class, but of a different series. Spreader: A commodities trader who attempts to profit from a change in price differences between commodities, futures contracts, or options contracts; a commodities arbitrageur. Standard Deviation: Standard Deviation measures the dispersal or uncertainty in a random variable (in this case, investment returns). It measures the degree of variation of returns around the mean (average) return. The higher the volatility of the investment returns, the higher the standard deviation will be. For this reason, standard deviation is often used as a measure of investment risk. Sterling Ratio: This is a return/risk ratio. Return (numerator) is defined as the Compound Annualized Rate of Return over the last 3 years. Risk (denominator) is defined as the Average Yearly Maximum Drawdown over the last 3 years less an arbitrary 10%. To calculate this average yearly drawdown, the latest 3 years (36 months) is divided into 3 separate 12-month periods and the maximum drawdown is calculated for each. Then these 3 drawdowns are averaged to produce the Average Yearly Maximum Drawdown for the 3 year period. Systematic Trading: A method of trading which follows a mechanical set of rules, normally using computer models, producing entry and exit orders to form trading decisions. Targeted Worst Drawdown (DD): The expected worst drawdown a CTA can expect in the program. Trend Following: Trend following is a strategy that simply follows trends based on certain technical indicators (e.g. moving averages, breakouts, etc.). CTAs that specialize in this strategy can profit from both rising markets (by being long) and declining markets (by being short). Trend followers, however, often incur drawdowns during choppy market environments because they often get stopped out of trades. Value-Added Monthly Index (VAMI): VAMI is defined as the growth in value of an average $1000 investment. VAMI is calculated by multiplying (1 + current monthly ROR) x (previous monthly VAMI). VAMI assumes the reinvestment of all profits and interest income. Incentive and Management Fees have been deducted. VIX - Chicago Board Options Exchange (CBOE) Volatility Index: The ticker symbol for the Chicago Board Options Exchange (CBOE) Volatility Index, which shows the market's expectation of 30-day volatility. It is constructed using the implied volatilities of a wide range of S&P 500 index options. This volatility is meant to be forward looking and is calculated from both calls and puts. The VIX is a widely used measure of market risk and is often referred to as the "investor fear gauge". Worst DrawDown: The greatest cumulative percentage decline in month-end net asset value due to losses sustained by a pool, account or trading program during any period in which the initial month-end net asset value is not equaled or exceeded by a subsequent month-end net asset value. Such decline must be expressed as a percentage of the initial month-end net asset value, together with an indication of the months and year(s) of such decline from the initial month-end net asset value to the lowest month-end net asset value of such decline.